On 5th March the UK Government announced a major overhaul of the National Planning Policy Framework, stating that it will “deliver the homes the country needs”. Shaun Spiers, author of How to build houses and save the countryside, out today, argues that although well intentioned, the measures don’t go far enough. There was much to admire in the prime minister’s recent speech on housing. Theresa May called homelessness in our rich country “a source of national shame” and she is right. She pledged to increase house building, but to do so without “destroying the country we love”. And she attacked big developers for gaming the system and putting dividends and executive pay before building more homes. As I read the speech, I mentally ticked off many of the arguments in my new book, How to build houses and save the countryside. As a country, we have managed to pull off the difficult trick of building too few homes while losing too much countryside. Unfortunately, however, the policy changes announced by the PM are unlikely to change this. They are well-intentioned, but they do not go far enough. How can we do better? For years, debates on housing and planning have been largely shaped by free market think-tanks arguing for planning liberalisation: ‘Free up the Green Belt, let builders build, and the houses will come.’ Much of my time as chief executive of the Campaign to Protect Rural England (CPRE) from 2004 to 2017 was spent reacting to some half-baked report from Policy Exchange or the Adam Smith Institute (Alan Bennett’s ‘Adam Smith Institute for the Criminally Insane’). As Keynes almost said, ‘madmen in authority, who hear voices in the air, are distilling their frenzy from some think-tank scribbler of a few years back’. The anti-planning think-tanks have succeeded in weakening the planning system, but successive reforms over the last 15 years have had little impact on housing supply. This is because the principal cause of our failure to build enough new homes is not planning restrictions, but the fact that the state more or less stopped building houses 40 years ago. It is extraordinary that so many clever people could look at our failure to build enough homes and conclude that planning, rather than the collapse in council house building, must be to blame. The advocates of planning liberalisation ignor the fact that for 30 years after the Second World War, when more than 200,000 homes were built every year in the UK, local authorities built at least 100,000 of them. Between 1951 and 1979, 48% of new homes were built for social rent. After 1979, local authorities virtually ceased to build and neither the private nor housing association sectors increased their output enough to make up the shortfall. Thus the housing crisis. Where the planning system can be blamed for our failure to build enough houses is in its failure to control rising land prices. This is down to its weakness: what is needed is more planning, not less. The 1947 planning settlement had two sides. Its role in constraining development is well known and explains why it is under attack in some quarters. But it also ensured a plentiful supply of development land at reasonable prices. Between 1946 and 1970, work started on 32 new towns; these are now home to 2.76 million people, 4.3% of UK households. It was possible to create new towns because development corporations were given the power to buy land at agricultural prices, using the uplift in value that came with planning permission to fund the development. When work started on developing Milton Keynes, land contributed only around 1% of the cost of a new home. It now accounts for over half the cost of most new homes. The same principle can, of course, be used for sustainable urban extensions. We must also do much more to use the plentiful supply of previously developed land within towns and cities. There is enough suitable brownfield land in England to build at least a million new homes, and the supply is constantly replenished. Developers prefer to build on virgin green field sites as they are easier to develop and more lucrative, and the current system allows them to do so. Sajid Javid, the housing minister, has promised a more ‘muscular’ state, but he appears to be more eager to take on ‘nimby’ protestors than to foster some serious competition to the few volume house builders who currently dominate the market. What is needed is new housing providers, and the state – what Green Alliance trustee Mariana Mazzucato calls the entrepreneurial state – should be fostering them. However much the government pokes and cajoles them, the big builders have neither the means nor desire to build on the scale needed. We need new private sector providers – SMEs, custom builders, factory built homes – and fostering them requires concerted government action. The government should also support a serious programme of council house building – many Conservative councils are calling for the right to build – and fund housing associations to build social housing, so that they can recover their social mission. There is nothing un-Tory about this programme: Conservative governments built plenty of houses before 1979. As for the so-called NIMBYs, those fighting to protect the countryside from more executive homes and anodyne, anywhere-housing estates have nothing to be ashamed of. My book makes the case for some new housing on greenfield sites, but if we are to lose countryside, let’s make sure we lose it to beautiful, well-thought out developments that do something to help those in housing need. That shouldn’t be too much to ask, should it? 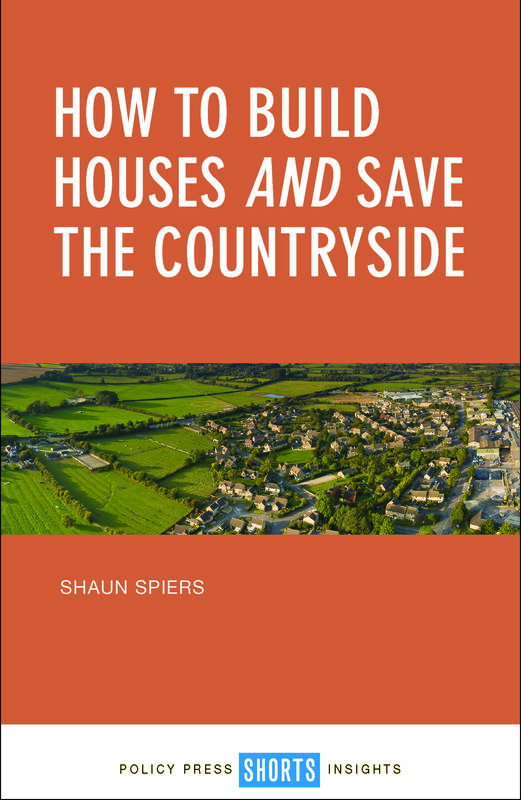 How to build houses and save the countryside, by Shaun Spiers is available with 20% discount on the Policy Press website. Order here for just £7.99.